The third and final phase of the house-to- house survey conducted by the United Nations Children's Fund (UNICEF) to identify non school going children and drop-outs for various reasons in the Trincomalee district was inaugurated Sunday at the Poonagar village in the Muttur education zone by the UNICEF Child Protection Officer, Ms. Christina Torsein, who is based in Trincomalee town, sources said. The inaugural event was held at Poonagar Thiruvalluvar Vidiyalayam in the Eachilampathu secretariat division in the Muttur education zone, which is held by the Liberation Tigers of Tamil Eelam, sources said. UNICEF's house-to-house survey has already been launched in the other two education zones of the district, Trincomalee and Kantalai, and is now underway, UNICEF sources said. Ms. Christina Torsein addressing the student volunteers and education officials at the inaugural event said that the objective of the survey is to collect information about the non-school going children and drop-outs, and implement a programme to raise awareness in the society that education is a fundamental right of every child. 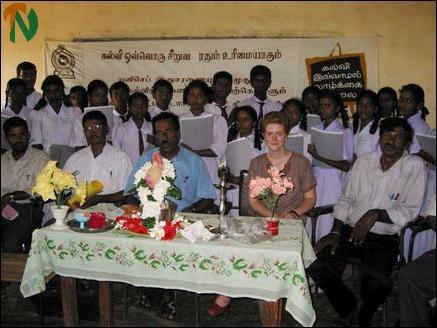 UNICEF Child Protection Officer Ms Christina Torsein is seen at Ponnagar Thiruvalluvar Tamil Vidiyalayam at the inaugural event. In the background is the statue of great Tamil scholar Thiruvalluvar, who wrote the "Thirukkural," considered a masterpiece of literary work by scholars worldwide. The survey would provide the reasons for the children to drop out from schools. "It is heartening to see that student volunteers are engaged in the survey to identify such children and drop outs," she said. Presiding over the event, Eachilampathu Divisional Education Officer Mr.V.Vettivelu said that sixteen schools are functioning in his division with a student population of about 3600. Non-school going children and dropouts are found in his division and the survey would help the authorities to design a scheme to raise awareness in the society, he added. Ms.Torsein commissioned selected student volunteers in the survey by pinning badges on them and handing over required documents needed for the survey. 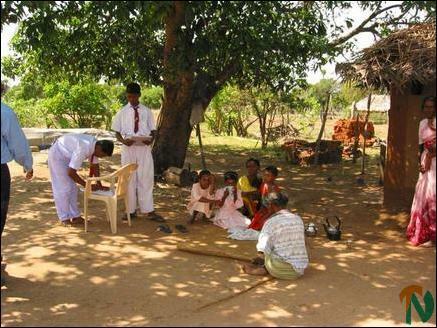 Thereafter, student volunteers began their survey by visiting every house in the village in the Eachchilampathu division. 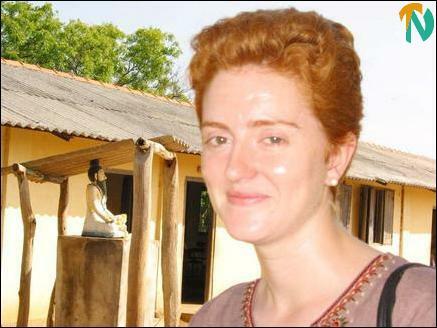 Ms.Torsein accompanied one group of student volunteers to a house and supervised the implementation of the project, sources said. Muttur zonal deputy director of education Mr.A.Kunarajaretnam and several principals and village level officials participated in the event.